for an introductory price of $500! Your $500 pre-order (shipping not included) is an early-bird price for a limited time. We are taking pre-orders now for delivery in Fall 2019. As an early purchaser, you're eligible for an early discount as a thank-you for your interest in helping bring the product to market. Imagine sitting at your dinner table and simply reaching right there to snip your fresh, living, nutrient-rich salad right into your bowl. Yup. It's that easy. tinyFarm's modular design fits perfectly with the urban lifestyle. It uses minimal energy output and it's a cinch to grow a large variety of high density greens with a touch of a button. tinyFarm is a revolution bringing nutrient-rich food to every home. Really... the tinyFarm is for everyone. But you can’t even keep a cactus alive, you say? It just happens to be your lucky day. tinyFarm is fully-automated. This means no more wondering when you should water your plants or if they are getting enough light. Sensors that monitor saturation and release the perfect amount of water just when the plants need it. All you need to do is fill the water reservoir when it texts you. What can I grow in tinyFarm? You can grow almost anything in tinyFarm that you can grow in soil. You're only limited by the height and width of the CounterTop. We have plans for larger units and will be updating you on this after the launch. The CounterTop model can feed you a large portion of microgreens everyday! Each tray holds about $25 worth of produce, at today's organic pricing! 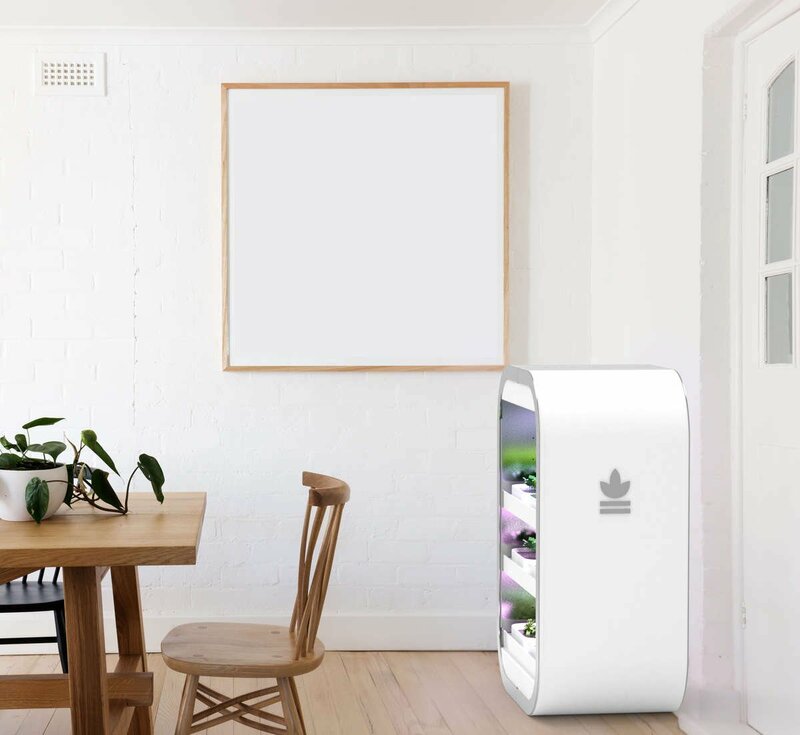 The tinyFarm can grow approximately $150 in microgreens in a month. That’s a pretty big bang and it costs less than $2.00 per month to run! Listed price of $500 is for the Countertop appliance only. It is designed to fit within the standard height of overhead cabinetry. If you were originally interested in purchasing the larger sizes --> (i.e., CoffeeTable-2 shelf or Floor Model-3 shelf) you can stack multiple Countertop Units on top of each other to achieve this. The taller units will be available in 2019. Email us at contact@modgarden.com for an even deeper discount on multiple/custom orders! Now, get ready to become a tinyFarmer! YOU can become a tinyFarmer— for an introductory price of $400! for the CounterTop unit (price includes FREE shipping and tax). 1. Full Payment: Pay $400 now to receive FREE shipping, tax and 3 months consumables (soil + seeds*). 2. Deposit: Pay $100 now, then pay $300 + taxes + shipping + consumables upon delivery. We are taking pre-orders for delivery in Fall of 2018. You can grow almost anything in tinyFarm. The CounterTop model (with two trays) can feed you a large portion of microgreens everyday! Each tray holds about $25 worth of produce, at today's organic pricing! 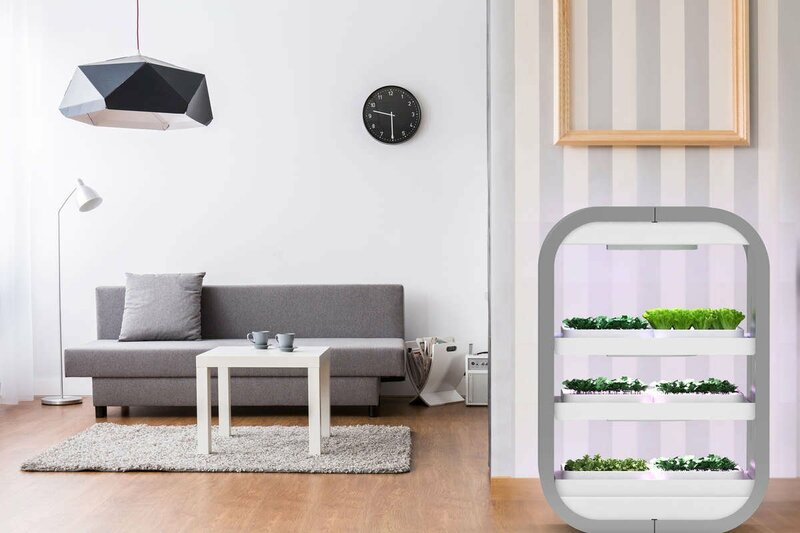 tinyFarm CounterTop unit can grow approximately $150 in microgreens in a month. Listed price of $400 is for the Countertop appliance only. If you were originally interested in purchasing the larger sizes --> (i.e., CoffeeTable-2 shelf or Floor Model-3 shelf) you can stack multiple Countertop Units on top of each other to achieve this. The taller units are expected in 2019. *Limitations apply to type of seeds. More details to follow as we near delivery.